Street scene in Wonsan City, Democratic People’s Republic of Korea (DPRK). The United Nations today called for some $111 million to fund its humanitarian operations in the Democratic People’s Republic of Korea (DRPK) in 2015, covering activities in food and agriculture, health and nutrition, and water and sanitation. The call comes as the UN Office for Coordination of Humanitarian Affairs (OCHA) has released its latest assessment that addresses the country’s critical humanitarian needs which remain drastically underfunded. According to the UN, among a population of 24.6 million people, approximately 70 per cent (18 million people) are considered food insecure, and are not able to access an adequate and diverse nutritious diet to live healthily. Malnutrition rates continue to be a public health concern, with the chronic malnutrition (stunting) rate among children under five at 27.9 per cent; 4 per cent of them are acutely malnourished (wasting), according to the 2012 National Nutrition Survey. Under-nutrition is a fundamental cause of maternal and child death and disease. Health service delivery is inadequate, and many areas of the country are not equipped with sufficient facilities, equipment or medicines. Safe drinking water and inadequate sanitation services are a fundamental problem, contributing to high and chronic instances of diarrhoea, respiratory infections and waterborne diseases. Food production is hampered by a lack of agricultural resources, such as seeds and fertilizers, and is highly vulnerable to shocks, particularly natural disasters like floods. Funding these humanitarian priorities will enable the five UN agencies – the World Food Programme (WFP), the UN Children’s Fund (UNICEF), the World Health Organization (WHO), the UN Population Fund (UNFPA), and the Food and Agriculture Organization (FAO) – already working on the ground to continue programmes that provide many vulnerable people with the basics. The commitment and support of the international community is vital. The UN needs to continue to build on positive developments, otherwise the progress made in the past decade to improve food security, health and nutrition will not be sustained. The UN will continue to work towards addressing the structural causes of vulnerabilities and chronic malnutrition through development interventions agreed with the DPRK Government, the press release concludes. 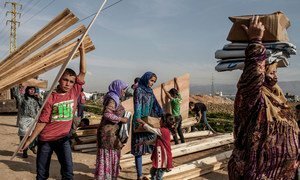 Poorly-funded United Nations aid operations received a boost today when Valerie Amos, the UN’s humanitarian chief, announced the allocation of $100 million from the Central Emergency Response Fund (CERF) to boost relief work in twelve countries in need.